Promising the convenient pick-ups of Uber (found all over) and drop-offs of Car2Go (which can be parked anywhere), new cycle-sharing services aim to overturn the paradigm of dock-to-ride-to-dock. A single company in China has already put more than a million such bicycles on the streets. Users simply pull up an app to locate the closest bike then unlock it digitally by scanning a QR code. Anyone who has used dock-based bike sharing systems know they come with problems — they might not be close by, or could be filled (when you’re dropping off) or empty (when you’re picking up). On the automobile front, similar issues with some sharing companies have been solved by allowing users to leave cars wherever they want. This can result in concentrations of cars, though, that need to be spread back out — and a similar problem exists for bikes. 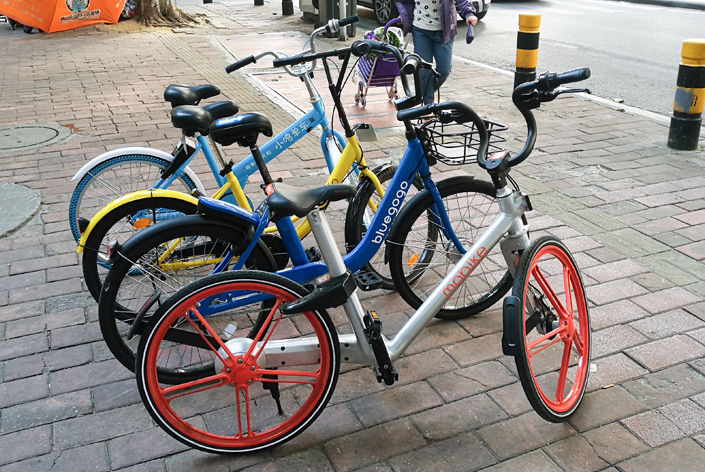 While small but similar programs exist elsewhere, The Guardian describes the problem as it has unfolded in China: “Seven hundred miles to the south-west, on the streets of the fast-growing Pearl River manufacturing hub of Guangzhou, the colourful dockless share bikes are everywhere. They are parked up by the hundred outside shopping malls and metro stations, often blocking the pavement; others, rendered useless by missing saddles, broken locks.” In other places, the shared bikes are piled up in alleys and vacant lots. Some companies believe that docking stations are the long-term solution, but others continue to experiment with alternative approaches, like: marking out preferred spots on the sidewalk then adding or deducting credits based on bike drop-off placement. For now, though, these reports have to be done manually, relying on crowd-sourced participants. As GPS gets more accurate, though, it may be possible to do this automatically. In a way, this method would replace physical stations by creating virtual ones in the form of acceptable micro-areas on the digital map.